I got a bunch in the last few weeks. I noticed on the new World of Cars card some of them are mislabeled though. 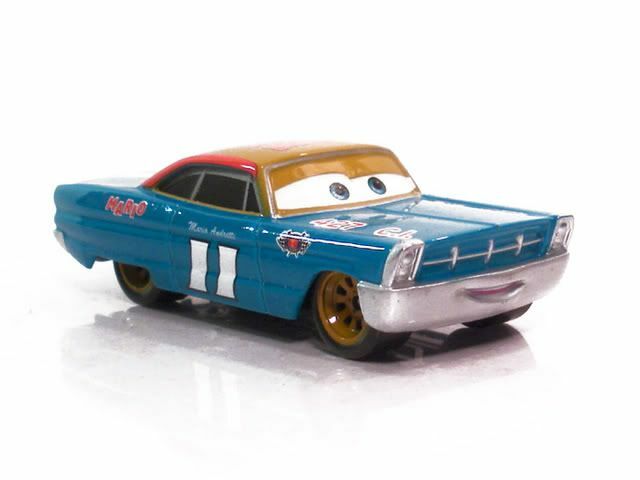 For example, Radiator Springs McQueen is now labeled Flash Lightning McQueen and the Radiator Springs McQueen with numbering (95) is also labeled Flash Lightning McQueen. There seems to be lack of selection in my neck of the woods lately. Lots of Tex Dinocos and Yellow/Gold Ramones on the shelves but nothing much else. In the local Toys R' Us they had big wall of Cars, but it was replaced with summer toys recently. I'm hoping near the end of the summer, the Cars selection will be bigger with the winter/holiday shopping approaching. Now that the World of Cars cards are numbered, is there a list anywhere online that corresponds with the numbering? Coheteboy, you don't happen to have it on that link you posted on the first page of this thread do you? 023 - DALE EARNHARDT JR. I actually hate the way Mattel had them numbered. They seem to be numbered out of importance of the character rather than the number in which they were released. Ooh do you have a pic of the Mario Andretti one? I happen to know the 4 Ramone cars were recalled because the were not selling on the sheves here in Canada..... so we pulled them all off the shelves and sent them back. So if your collecting them. There are going to be fewer of them out. I sent back 24.... and I am just 1 store . No, you can't drive IT. Drive it like it's stolen. We've been selling these at my store (Ralphs) and they've been hitting the markdown rack lately. Didnt get a good look at the price but I believe it was under a dollar. Worth taking a look next time you're at a grocery store. Finally found the PT Flea and Flik set at the Soda Fountain Store next to the El Capitan! NO WAY. How much was it? Welp, Melonballer, looks like i need to get myself over there sooner than I had thought! It was $14 I beleive, and they had about 5 of them. Funny thing, is they were about the only cars in the store! When most stores carry them for $8, $14 is scalper prices as far as I'm concerned. Well it's Disney ) And a tourist attraction to boot! and they're only one in town who carry this set! Well, I'm happy I found them, so I guess it doesn't matter, does it? Last edited by yoyoflamingo; 04-29-2008, 05:19 PM. Of course. That is what is important. I would not have paid that, but I am glad you got what you wanted. Went to the local Wal-Mart today and after I picked up my copy of The Classic Caballeros Collection on DVD I headed for the toy section. I noticed they got some of the the World of Cars three-packs in. I dug through them and found one Dinoco Dream 3-pack, the one with the gold Mia and Tia and Bling Bling McQueen! So naturally, I added it to my collection. I found DJ today. The only one from the gang that I need is Snot Rod. I'm glad for you Barbossa. It has been quiet down this way. A few shipments of individual cars have arrived, including Chuki. No sign of the 2 packs. All of a sudden there's more showing up on store shelves. Fred and Yeti used to be a hard to find, and now they got a whole bunch on the World of Cars card at Toys R Us. Yeti huh? that's great. I have only seen him once. Have you been seeing more Dale Earnhardts? I came across the 2 pack of Mia and Tia today in Dinoco Blue. So be on the watch for it. I found it at Fred Meyer. I wish they would do more NASCAR guys, but I guess only Dale Jr was in the movie. All times are GMT-8. This page was generated at 08:26 AM.